Na manhã deste Sábado celebraríamos não só mais uma Cerimonia Tradicional da Família Moy Fat Lei, mas também os seus três primeiros anos de existência. Pela primeira vez numa celebração como esta, não contamos com a presença de Si Fu que fez questão de enviar seus melhores desejos.Ainda assim,estiveram presentes alguns queridos membros vitalícios da Família Moy Jo Lei Ou, da qual faço parte, que carinhosamente dedicaram sua manhã de Sábado para prestigiarem a ocasião. Dentre eles: Carmen Maris que tinha uma viagem logo em seguida, Marcelo Firmino e seus convidados Bruno e Cristiano, que fotografaram todo o evento. 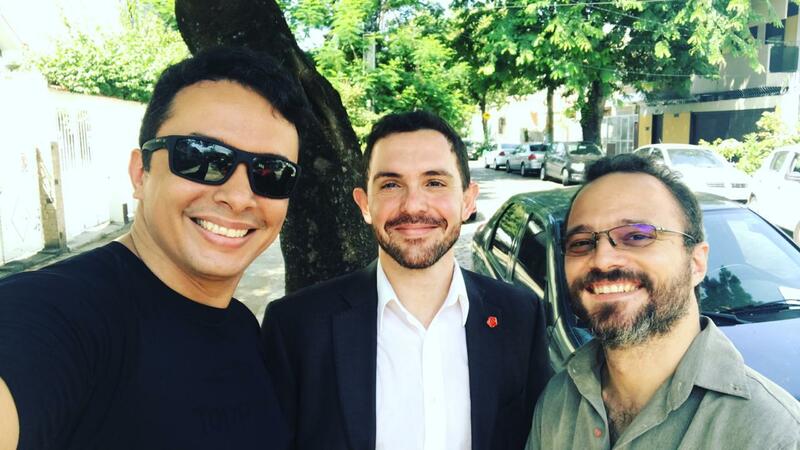 Rodrigo Moreira, que excepcionalmente nesta ocasião aceitou a meu pedido ser orientador/apresentador de todos os acessantes/ingressantes. E por fim Carlos Antunes. On the morning of this Saturday we would celebrate not only another Traditional Ceremony of the Moy Fat Lei Family, but also its first three years of existence. For the first time in a celebration like this, we did not count on the presence of Si Fu who made a point of sending his best wishes. Still, there were some dear family members of the Moy Jo Lei Ou Family, of which I am a part, who affectionately dedicated their Saturday morning to celebrate the occasion. Among them: Carmen Maris who had a trip soon after, Marcelo Firmino and his guests Bruno and Cristiano, who photographed the whole event. Rodrigo Moreira, who exceptionally on this occasion accepted at my request to be the introducer of all the participants / entrants. And finally Carlos Antunes. São mais de dez anos desde que Carlos Antunes veio a antiga Unidade Méier(FOTO) para acompanhar Si Fu e poder compartilhar um pouco de suas surpreendentes vivências em apenas dois anos na Família Moy Jo Lei Ou àquela altura, com nomes como: Thiago Thiers, Raphinha Caputo, Rodrigo Caputo, Lucas Eustáquio, Felipe Mury, Gustavo Santos, Carla Bastos, Priscila Borges e Guilherme Farias. It's been more than ten years since Carlos Antunes came to the old Méier Studio(PHOTO) to accompany Si Fu and share some of his amazing experiences in just two years in the Moy Jo Lei Ou Family at that time with names like Thiago Thiers, Raphinha Caputo, Rodrigo Caputo, Lucas Eustáquio, Felipe Mury, Gustavo Santos, Carla Bastos, Priscila Borges and Guilherme Farias. Onze anos depois daquela primeira visita muita coisa mudou. Carlos Antunes compartilhou impactantes palavras(FO|TO) com os membros de minha Família Kung Fu, mas bem antes disso, o recebi no segundo pavimento do Mo Gun com sua esposa e filha, minha querida irmã Kung Fu Lu Castro e sua filhinha Alice. Foi possível termos uma profunda conversa sobre mudanças. Carlos compartilhou gentilmente algumas das fortes experiências que vem vivendo na vida particular e profissional, associando seus êxitos ao que aprendeu com Si Fu. Carlos também estava muito tocado com o fato de estarmos sentados lá em cima esperando sermos chamados para o início da Cerimônia: "...Cara, outro dia éramos nós lá embaixo..." - Aquilo me fez pensar muito depois. Eleven years after that first visit, much has changed. Carlos Antunes shared life-changing words (photo) with members of my Kung Fu Family, but well before that, I received him on the second floor of the Mo Gun with his wife and daughter,my dear sister Kung Fu Lu Castro and their little girl Alice . It was possible to have a profound conversation about change. 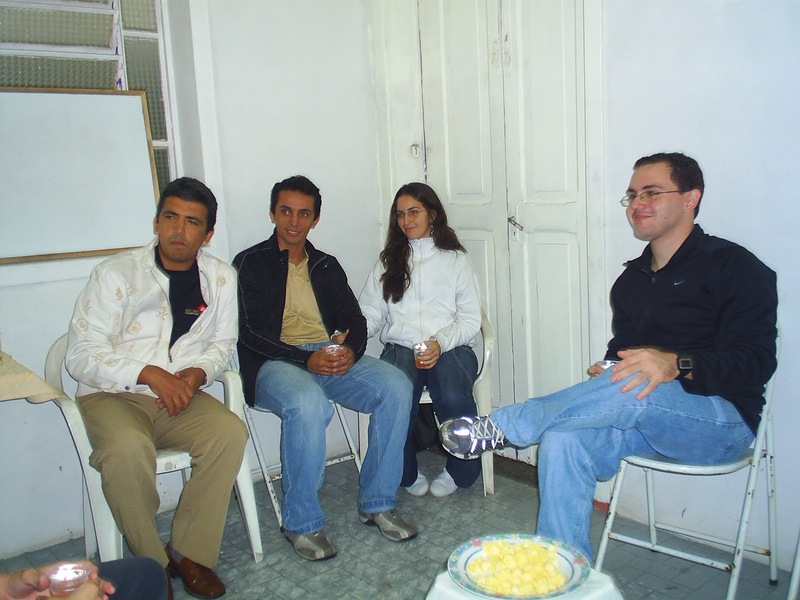 Carlos has kindly shared some of the strong experiences he has been experiencing in private and professional life, associating his successes with what he learned from Si Fu. Carlos was also very touched by the fact that we were sitting upstairs waiting to be called to the beginning of the Ceremony: "... Man, the other day we were down there doing the same for Si Fu ..." - That made me think much later. Nos quatro primeiros meses de 2011, nos quais estava sem Mo Gun. Um dos lugares que nosso grupo praticou foi a garagem de Felipe Mury (foto). Rodrigo Moreira(primeiro à esq. ), meu irmão Kung Fu, não só apresentou Felipe à Família Moy Jo Lei Ou, como também Rodrigo Demetrio pouco tempo depois. Já na minha Família, ele apresentou o membro vitalício Filipe Lima e na manhã deste Sábado apresentaria Jório Jorge. In the first four months of 2011, in which I was without Mo Gun. One of the places that our group practiced was the garage of Felipe Mury (photo). 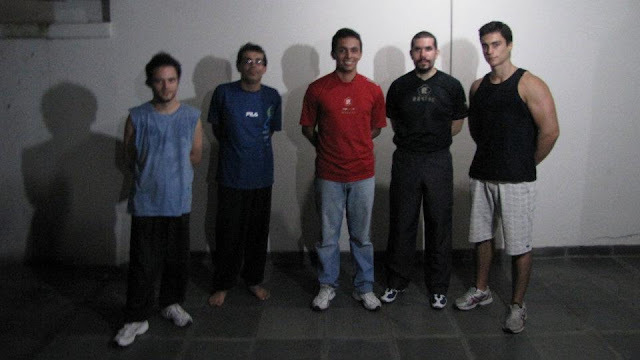 Rodrigo Moreira (first to left), my brother Kung Fu, not only introduced Felipe to the Moy Jo Lei Ou Family, but also Rodrigo Demetrio shortly thereafter. Already in my Family, he presented the special student(disciple) Filipe Lima and on the morning of this Saturday would present Jório Jorge. Fiquei muito feliz quando Rodrigo apresentou Lee Pereira na manhã deste Sábado. Sua presença sempre influencia positivamente minha Família Kung Fu. Essa inclinação à apoiar de Rodrigo, tem sido de fato muito importante para o desenvolvimento da Família Moy Fat Lei. Lee, se juntou a nós no maior momento de transição de nossa Família, mas ele se manteve conosco,e com seu jeito comunicativo, era como se desde o primeiro dia, já fosse um membro da Família Moy Fat Lei. I was very happy when Rodrigo introduced Lee Pereira this Saturday morning. His presence always positively influences my Kung Fu Family. This inclination to support by Rodrigo, has indeed been very important for the development of the Moy Fat Lei Family. Lee, joined us in the greatest moment of transition of our Family, but he stayed with us, and with his communicative way, it was as if from day one he was already a member of the Moy Fat Lei Family. Rodrigo também apresentou Jório Jorge. Jório, amigo de longa data de Rodrigo, foi o primeiro praticante a se matricular na nova casa kung fu da Família Moy Fat Lei a qual chamamos de "Mo Gun". Rodrigo also introduced Jorio Jorge. Jorio, longtime friend of Rodrigo, was the first practitioner to enroll in the new Moy Fat Lei kung fu house we call "Mo Gun." 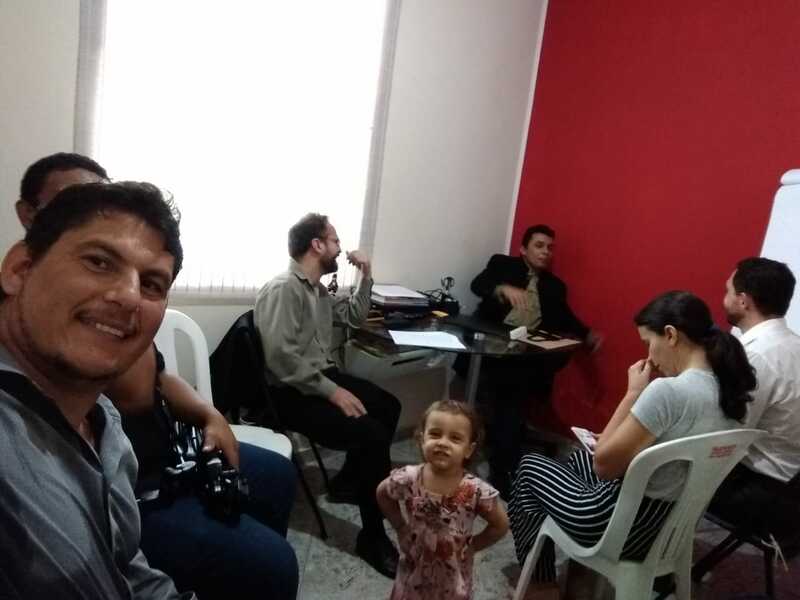 Curiosamente, o primeiro praticante a se matricular na primeira sede do Núcleo Méier,à época com apenas 13 aninhos(FOTO) foi o Daai Si Hing da Família Moy Fat Lei meu To Dai Pedrinho Freire. Espero que este fato seja visto como uma feliz coincidência de pessoas que impactaram positivamente a Família Moy Fat Lei. Curiously, the first practitioner to enroll in the first school of us in Meier, at the time only 13 years old (PHOTO) was the Daai Si Hing of the Moy Fat Lei Family, my To Dai Pedro Freire. I hope this is seen as a happy coincidence of people who have positively impacted the Moy Fat Lei Family. Outro ponto curioso da primeira visita de Carlos Antunes a antiga Unidade Méier, é que na ocasião, foi servido fandangos e guaraná(foto). Hoje chega a ser engraçado ver uma foto dessas, mas eu tenho certeza que fizemos de coração. Era o melhor que minha capacidade de mobilização podia prover naquele momento, ou talvez, o que eu acreditava ser capaz de fazer. 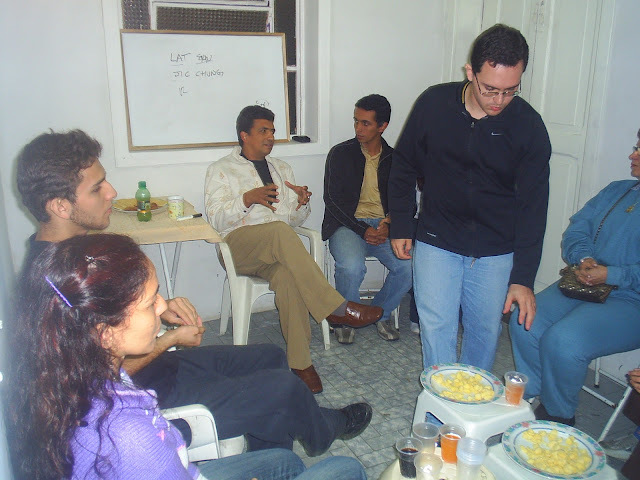 Another curious point of Carlos Antunes' first visit to the old Méier Studio is that at the time, fandangos(Elma Chips snacks) and guaraná(soda) (photo) were served. It's funny to see such a picture today, but I'm sure we did it from the heart. It was the best that my ability to mobilize could provide at that moment, or perhaps, what I believed to be able to do. Me emocionei muito com o que encontrei naquela manhã ao descer com Carlos Antunes e Lu. Havia uma mesa disposta no meio da sala de prática, e haviam muitos rostos queridos de pessoas de muita fibra que vem me acompanhando nessa aventura nos últimos três anos. I was very moved by what I found that morning when I went down with Carlos Antunes and Lu. There was a table set out in the middle of the practice room, and there were many dear faces of high-fiber people who have been following me on this adventure for the last three years. Minha discípula Caroline Archanjo(Foto) coordenou junto de outros dois queridos discípulos: Seu esposo Luiz Grativol e também Cayo Cesar, aquele café-da-manhã. Os membros da Família Moy Fat Lei participaram ativamente coordenados por estes três que até outro dia eram um casal de jovens batendo à porta da Rua Medina e um garoto com cara de sono, boné e camisa dos Lakers. Este poder silencioso de transformação do Kung Fu é simplesmente mágico, e talvez nunca consigamos explicar como ele de fato aja. My disciple Caroline Archanjo (Photo) coordinated with two other dear disciples: Her husband Luiz Grativol and also Cayo Cesar, that breakfast. Members of the Moy Fat Lei Family actively participated in coordinated by these three who until a day were a couple of young people knocking at the door of the old school and a sleepy-looking kid, wearing a cap and a Lakers jersey. This silent power of transforming by Kung Fu is simply magical, and we may never be able to explain how it actually acts. Talvez seja esse poder transformador que faz com que irmãos Kung Fu como Marcelo Firmino(foto),venha de outra cidade por dois finais de semana seguidos. A fim de registrar não só a Cerimônia da Família Moy Jo Lei Ou, mas deste seu irmão Kung Fu que aqui escreve. Perhaps it is this transforming power that makes Kung Fu brothers like Marcelo Firmino (photo) come from another city for two consecutive weekends. In order to register not only the Ceremony of Moy Jo Lei Ou Family, but also, the Ceremony of this his brother Kung Fu who writes here. Vitor que naquela manhã acessou o Nível Superior Inicial "Mui Fa Jong", mal conseguia se mover por toda a semana devido a uma lesão que possui na coluna. Graças a isso, disse no meio da semana que se sentia preocupado com a Cerimônia por não estar conseguindo andar. Na manhã deste Sábado Vitor chegou com um sorriso bobo no rosto, satisfeito com o fato de estar podendo se mover graças a uma sessão de Pilates no dia anterior. Isso foi o suficiente, para que eu pedisse que ele, em meu nome, demonstrasse a primeira parte do "Biu Ji" para os acessantes daquela manhã. Vitor that morning had access to the "Mui Fa Jong" domain. He could hardly move for the whole week due to an injury that he has in his cervical. Thanks to this, he said through the week that he was worried about the Ceremony for not being able to walk. On Saturday morning Vitor arrived with a silly smile on his face, pleased that he was able to move thanks to a Pilates session the day before. So I asked him, on my behalf, to demonstrate the first part of "Biu Ji" for Caroline, Luiz and Cayo that morning. Pedi que Cayo, Luiz e Caroline prestassem muita atenção na demonstração que seu Si Hing iria fazer. Pois tinha certeza da capacidade de ajuste de Vitor, de uma responsabilidade como essa, à sua situação física. I asked Cayo, Luiz, and Caroline to pay close attention to the demonstration their Si Hing would make. Because I was certain of Vitor's capacity for adjustment, of such a responsibility with his physical condition. Junto de Vitor, Keith Markus(foto de pé) foi o outro membro vitalício da Família Moy Fat Lei a acessar o Domínio Mui Fa Jong naquela manhã. Lembro de uma conversa com Si Gung enquanto lhe dava uma carona do aeroporto até um estúdio de gravação em Jacarepaguá em 2017, quando lhe perguntei se achava que eu estava sendo precipitado ao convidar três pessoas para Baai Si com um ano de Família Moy Fat Lei. Ele teria dito algo como:"...Não sei...Só saberemos com o desdobramento sequente. Você pode por exemplo convidar os três e os três afastarem logo em seguida...E aí? O que você vai fazer? Você é o Si Fu, você precisa pensar nessas coisas..."
Keith Markus, assim como seu Si Hing Vitor Sá, tem sido grandes exemplos de fibra e perseverança. Ambos parecem ter um estranho dom para se envolverem com multiplas missões simultaneamente em suas vidas, e ainda assim, sempre se ajustam para voltarem na semana seguinte. Isso inspira os demais. Along with Vitor, Keith Markus (standing in the photo above) was the other special student(disciple) of the Moy Fat Lei Family to access the Mui Fa Jong Domain that morning. I remember a conversation with Si Gung while I was giving him a ride from the airport to a recording studio in Jacarepaguá neighborhood in Rio in 2017 when I asked him if he thought I was being rash by inviting three people to Baai Si with a year of Moy Fat Lei Family. He would have said something like: "... I do not know ... We will only know with the sequential unfolding.You can, for example, invite the three and the three to leave the Family soon after ... So what are you going to do? You are the Si Fu, you need to think about those things ... "
Keith Markus, as well as his Si Hing Vitor Sá, have been great examples of fiber and perseverance. Both seem to have a strange gift to engage with multiple missions simultaneously in their lives, yet they always adjust to coming back the following week. It inspires others. Para dar acesso ao "Mui Fa Jong" aos dois discípulos, demonstrei pessoalmente sem o boneco de madeira(Muk Yan Jong) a duas primeiras partes de sua sequência de movimentos. To give access to "Mui Fa Jong" to the two disciples, I personally demonstrated without the wooden dummy (Muk Yan Jong) the first two parts of its sequence of movements. Trajando o mesmo "Tong Jong" doze anos antes, Si Fu realizou o mesmo ato ao demonstrar as duas primeiras partes da sequência para Xenia D'avila e Paula Gama durante Cerimônia da Família Moy Jo Lei Ou. 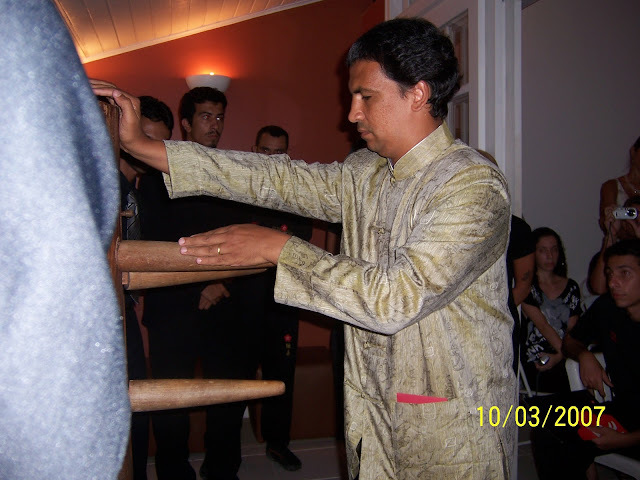 Wearing the same "Tong Jong" twelve years before, Si Fu performed the same act by demonstrating the first two parts of the sequence to Xenia D'avila and Paula Gama during the Moy Jo Lei Ou Family Ceremony. É que em Novembro de 2017, durante a celebração do meu aniversário, Si Fu me presenteou com este histórico "Tong Jong". Um momento muito emocionante, pois Si Fu também estava usando ele no momento em que ingressei na Família Moy Jo Lei Ou. Is that in November 2017, during the celebration of my birthday, Si Fu presented me with this historic "Tong Jong". A very emotional moment, because Si Fu was also wearing it the moment I joined the Moy Jo Lei Ou Family. Após a Cerimônia, eu e Rodrigo acompanhamos Carlos até seu carro, e o que era para ser uma despedida casual, se tornou numa das conversas mais emocionantes de nossa história juntos. Realmente fiquei impressionado com aquele momento. Havia muita honestidade e emoção no que era dito. Sai dali pensativo e caminhei com o querido Rodrigo até onde meus discípulos aguardavam para o almoço. Ao final, como aquela energia ainda estava em nós, decidimos tomar um café. E para mim, o mais especial de uma manhã como essa, é que eu fui envolvido pela dedicação de inúmeras pessoas de uma forma tão intensa, que me marcou profundamente. Entrei no Mo Gun e pensei: "É, talvez cochile um pouco antes de ir até a Barra." - Foi como se tivesse sido combinado, logo após esse inocente pensamento meu telefone toca: "Cayo Cesar". Atendo e este faz a clássica pergunta que tantas vezes fiz ao meu Si Fu: "Si Fu...Tá ocupado? "- Risos. Cayo foi até o Mo Gun e ficamos juntos até as 17:00h, quando sai em direção ao Núcleo Barra, e sem cochilo... Risos. After the Ceremony, Rodrigo and I accompanied Carlos to his car, and what was to be a casual farewell, became one of the most emotional and strongests conversations in our history together. I was really impressed by that moment. There was a lot of honesty and emotion about what was said. I left the place thoughtfully and walked with the dear Rodrigo to the restaurante my disciples waited for lunch. In the end, since that energy was still in us, we decided to have coffee. And for me, the most special of a morning like that, is that I was surrounded by the dedication of countless people in such an intense way that it struck me deeply. Cayo went to the Mo Gun and we stayed together until 17:00 PM, when I left for the Barra School and without a nap ... Lol.